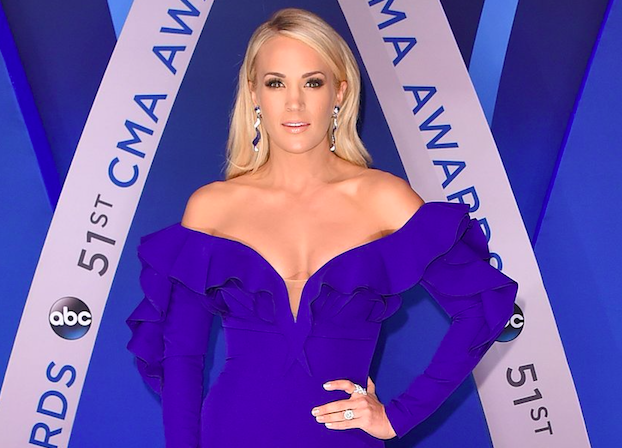 Carrie Underwood has been accused of lying after she opened up about the injuries she sustained after falling on the steps of her home in November. In an emotional blog post, the 34-year-old country singer said she’d broken her wrist following the accident. She then said she eventually had to have 40/50 stitches to her face. Ouch! Most of you know I tripped and fell and broke my wrist in November. I’m still doing regular physical therapy for it, but all is coming along. There’s also another part of the story I haven’t been ready to talk about, since I’ve still been living it and there has been much uncertainty as to how things will end up. It’s crazy how a freak random accident can change your life. In addition to breaking my wrist, I somehow managed to injure my face as well. I’ll spare you the gruesome details, but when I came out of surgery the night of my fall, the doctor told Mike he’d put between 40-50 stitches in. Now, here we are seven weeks later and even though I’ve had the best people helping me, I’m still healing and not quite looking the same. I honestly don’t know how things are going to end up but I do know this: I am grateful. I am grateful it wasn’t much, much worse. I’m grateful for the people in my life that have been there every step of the way. I’ve still got a way to go in the recovery process, but it’s encouraging to see every day be a little better than the last. Another reason I’m telling you this now is because I’m heading in the studio next week. I’m determined to make 2018 amazing and I want to share things with you along the way and when I’m ready to get in front of a camera, I want you all to understand why I might look a bit different. I’m hoping, by then, the differences are minimal, but, again, I just don’t know how it’s all going to end up? I thinl she had a face lift. The point is, Carrie Underwood is asking for our support. She’s going through a tough time in her life. It doesn’t matter whether you like her music or not, whether you’re a country fan or not, she needs our support. Your fans love you and no matter what we will be by your side every step of the way! We are fans because of who you are, which is an incredibly caring and inspirational person. Get well soon and we can’t wait to sing along with you in 2018! The point is Carrie Underwood is asking for our support.She is going through a tough time in her life.It doesn't matter whether you like her music or not ,whether you a country fan or not she needs our support. @carrieunderwood Your fans love you and no matter what we will be by your side every step of the way! We are fans because of who you are, which is an incredibly caring and inspirational person. Get well soon and we can't wait to sing along with you in 2018! Your true beauty lies within your being. It is something that cannot be learned. It is your true essence. Your ❤️ heart and soul. No matter how you look outwardly I know the true Carrie and I’m proud to call her friend.